Even traditional forms of information provision such as libraries and publications are moving online. All in all, information providers are responding to customer demand by making more and more information available not only online, but also in a searchable format (see Figure 1 below). Despite this trend, it is often the most valuable information which cannot be found online. An example of this is competitor intelligence, regarded by most information users as the most difficult type of information to acquire. Collecting such information often requires access to an expert market intelligence consultant, who will glean information from the competitor or another source. Similarly technical information, particularly in rapidly evolving (and therefore confidential) areas such as product development, is often poorly documented and therefore requires one-on-one discussion with a technologist. In other words, whilst general information is often available freely in every sense of the word, information that is sufficiently specific, validated and well presented to be of real use to decision-makers often requires a specialist market intelligence provider. Market intelligence is a term that is widely used, widely misunderstood, and often mistaken for a mysterious art requiring high-level detective work. Before providing advice on how market intelligence can potentially benefit your business, it is therefore essential that we begin this paper by agreeing on a definition. Market Intelligence is the information relevant to a company’s markets, gathered and analyzed specifically for the purpose of accurate and confident decision-making in determining market opportunity, market penetration strategy, and market development metrics. The last few years have seen the arrival of ‘new’ market research. Gone are the days when market research posed as a quasi-academic activity that only flirted with the business decision-making process. Today, market researchers are much more focused on improving the quality of business decision-making. In practice market intelligence tends to refer to the branch of market research called market assessment research, which is designed to help a company establish a foothold in a market, or increase its presence in a market. As such, typical areas covered would be routes to market analysis, market size calculations, competitor analysis, substitute products (or services) analysis, and market growth predictions – in summary, information about the external market environment. Market intelligence can be obtained externally – by a market research and intelligence company, or by an internal department. Once the market intelligence is obtained, it is usually managed in-house, often in an informal fashion, but increasingly with the assistance of IT-based market intelligence systems provided by technology and market research companies. In effect, competitor intelligence is a specific type of market intelligence. As a result, a good quality provider of market intelligence should offer competitor intelligence as part of its range of services. Business intelligence (BI) is also a term that is frequently used interchangeably with the term market intelligence, again incorrectly. Business intelligence refers to all of the information used by a company for the purposes of decision-making, but tends to refer to data relating to the company itself, rather than its market environment. BI therefore includes sales data, production data and financial data, and tends to be collected internally rather than by outside agencies. BI is usually closely related to businesses’ KPIs (key performance indicators). With the above definitions in mind, this paper discusses how to add value to your business using market intelligence, with particular attention paid to the important discipline of competitor intelligence. Market intelligence can be used to assist with more or less every decision faced by a company. The overriding purpose of most market intelligence, however, is to help the company grow – to increase revenue, profit, or market share. Good market intelligence can therefore have a huge return on investment – $40,000-$150,000 spent on intelligence can generate or save many times that amount in extra customer revenue or the avoidance of a bad investment decision. The purposes of market intelligence are constantly evolving. 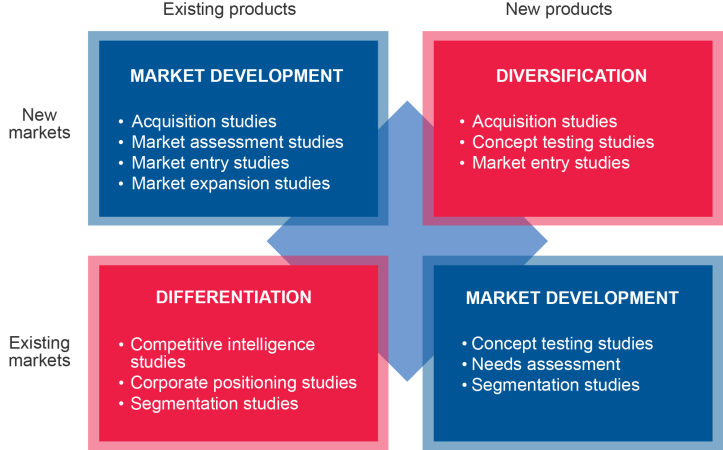 Figure 2 shows the key purposes of market intelligence, and the type of market research or market intelligence study that is typically used to meet these requirements. In short, conducting a comprehensive and actionable market entry or market expansion project requires a 360-degree view of the market. Competitor intelligence studies are in increasingly high demand, and typically companies seek the ‘inside’ view of that company’s strategy and approach. Sales figures and production data would be a typical example. Certainly this inside view can be extremely valuable. What can be even more valuable, however, is ‘external’ intelligence on the competitor. Such information does not require anyone to ‘tap up’ an employee or search through the company’s garbage can. 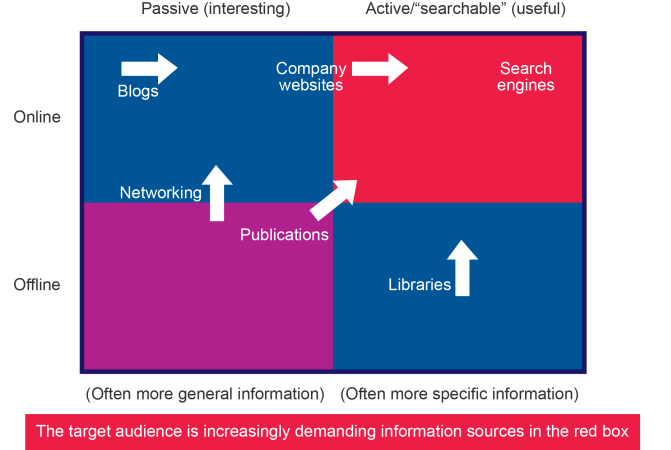 Typical sources of information used in a competitive intelligence study are described below. Press analysis – Publicly available information such as headline financial figures, changes of key personnel, senior management statements etc can be of great interest, and most companies conduct such research in-house on a regular but unsystematic basis. On a more formal basis, a common project conducted by external market research and intelligence agencies is marketing analysis of competitors. For example, detailed tracking of adverts placed over a period of time can be combined with exploration of publications’ advertising rates to come up with an accurate estimate of a competitor’s advertising budget. Press analysis can also be used to assess competitors’ marketing strategy (by assessing the messages behind the adverts) and, through examining employment advertisements, gain valuable intelligence on wage rates. Pricing research – there are a number of different types of pricing research. Statistical techniques such as conjoint analysis and SIMALTO are pure market research techniques which are used to calculate what prices the market would bear for different types of offering. In terms of competitive intelligence studies, competitor pricing research is easier to explain but arguably no easier to carry out! This painstaking work involves trawling websites, price lists and other sources of information for the prices of competitors’ products and services. This information is then benchmarked against one’s own prices. Competitor pricing research is increasingly difficult, increasingly valuable and increasingly expensive. The key reason for this is that pricing models are increasingly complex. Definitions of ‘product’ in most markets have broadened to encompass service benefits and intangible brand benefits. The services associated with a product are sometimes priced separately as add-ons, and sometimes included as part of one ‘all-in’ price. Even the product benefits themselves can be priced as part of one overall price is some cases, and as add-ons in others. By way of example, it is worth considering the way different cars are priced in the USA. A BMW 3-Series (www.bmwusa.com) is advertised at around $35,000 for a basic model, whereas the starting price of a Lincoln MKS (see www.lincoln.com) is advertised at between $37,000 and $38,000. It would therefore appear that the BMW is the cheaper vehicle. A closer look at the BMW website reveals, however, that the buyer is invited to ‘build their own’ vehicle. A host of options ranging from metallic paint to leather seats, sun-roofs and satellite navigation are available for extra incremental fees. Exactly the same applies to the Lincoln. However, not only does the price of each of the options vary between the vehicles, so too do the options themselves. The delivery fee for the BMW is $825, against $800 for the Lincoln – the price of these two equivalent offerings can be directly compared. This is the exception, however. Look further and it can also be seen that the Lincoln offers a set of ‘20’’ polished cast aluminum 11-spoke wheels’ for a fee of $1,195. The BMW offers no such option, but does offers ‘17” V-spoke wheels with run-flat tires’. How do we compare the prices of these two completely different types of wheel? Add to this running costs, fuel efficiency and other outgoings associated with owning a car, as well as the fact that prices of all packages, options and benefits constantly change over time, and it is clear that price benchmarking is an extremely difficult and resource-intensive task. Market research and intelligence agencies are employed, of course, to devote the time and expertise necessary to make sense of such data. The agencies scour pricing lists and store the information they gain into databases. As the databases are complete, closely comparable ‘options’ are compared directly against each other. In addition, typical ‘packages’ of benefits are drawn up and then priced. So, a ‘typical’ basic BMW package would be compared with a ‘typical’ basic Lincoln package, even if the composition of the two packages is not exactly the same. It is worth mentioning that competitor pricing studies allow us not only to compare prices, but also to compare our respective companies’ ability to capture value. If our product or service is more expensive than a competitor’s, this is only cause for concern if our revenue, market share or profit is decreasing. Our price must reflect the value to the market of the package of benefits offered. Every aspect of our product, associated services, and the intangibles such as brand should be charged for, if they are valued by the target audience. Competitor interviews – Competitor interviews are a difficult, but valuable means of gaining competitor insights. Clearly senior management such as Marketing VPs are particularly useful sources of information, if they can be persuaded to talk. Gaining co-operation with such groups is one of the most difficult tasks carried out by research and intelligence agencies. If the agency can avoid revealing the sponsor of the survey (this is very rare), a financial incentive may gain co-operation. Far more commonly, the respondent is happy to take part in an ‘information exchange’. This usually results in the respondent receiving a synopsis of the overall market research findings in return for a face-to-face or telephone interview. It should be highlighted that a competitor interview does not necessarily need to target a high-level respondent in order to be useful. Mid-management employees such as Sales Managers can be an extremely useful source of information on products, innovations, overall strategies and a host of other topics. These employees are trained to talk and persuade and tend to be less circumspect than their colleagues in other departments. The typical format of an interview with a competitor’s sales team is the ‘mystery shop’, where a market research agency rings makes contact as a prospective customer and obtains answers to a range of pre-defined questions. Speaking to a variety of competitors – If asking a competitor to provide details on their own business is difficult, asking them to talk about other market players is more easily achieved. Given that staff of all levels move between competing companies, and competitors talk to each other, asking Competitor 1 to ‘dish the dirt’ on Competitor 2, before asking Competitor 2 to return the complement, can be an extremely effective way of gaining competitor insight as well as an overview of the market as a whole. Customer interviews – There is no more effective, reliable or valuable source of competitor information than customers. Buyers have never been so willing to say exactly what they want, and how they want it, nor so willing to complain or take their business elsewhere if their requirements are not fulfilled. Customers often display a remarkable level of candor when talking about their suppliers, even those with whom they have a close and collaborative relationship. Issues as diverse as price, service, contractual details and technical information can be discussed, as well as ‘industry gossip’ such as who is buying who, or which company is in financial difficulties. Interviews with suppliers, distributors, other industry players and experts – In every industry it is worth mapping out the supply chain in order to assess who might be able to provide valuable market intelligence. Those at the centre of the supply-chain – intermediaries such as distributors, agents and importers – are often those that know most about the market, as they are in frequent contact with manufacturers and sellers alike. Most markets have a number of ‘experts’ of some kind who are independent and willing to share the information they possess. Industry associations and journalists at industry publications are typical examples. Company websites are an obvious, but increasingly effective, source of competitor information. Information which only a decade ago would have been top-secret, or only obtainable by making a visit to the company, is now freely available. Technical data sheets, company vision and strategy, product innovation, staff credentials and a host of further information is available to anyone willing to spend the time sifting through the often substantial content. It can be seen that competitor insight studies are diverse and rich in the information they provide. These studies provide a comprehensive description of the competitive environment as well as detailed competitor profiles covering topics such as company characteristics, needs, views on supplier performance, investment plans, marketing strategies, financial data, expansion record and plans and much, much more. 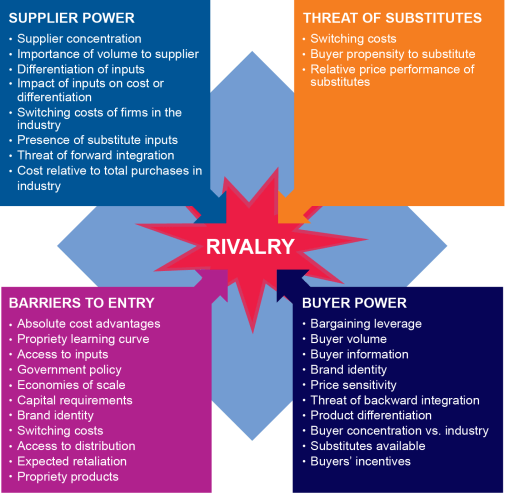 Competitor profiles are by nature tailor-made, although models such as Porter’s 5 Forces (see Figure 4 below) can be used as a basis for a high level assessment of the overall competitive environment in any markets. Needs assessment, customer satisfaction, corporate positioning and segmentation studies are based on two key sources of information – customers and potential customers. Indeed, the topic areas covered by each are similar, each referring (in different levels of detail) to how the decision-making process and buying process work, requirements from a supplier and views on suppliers. 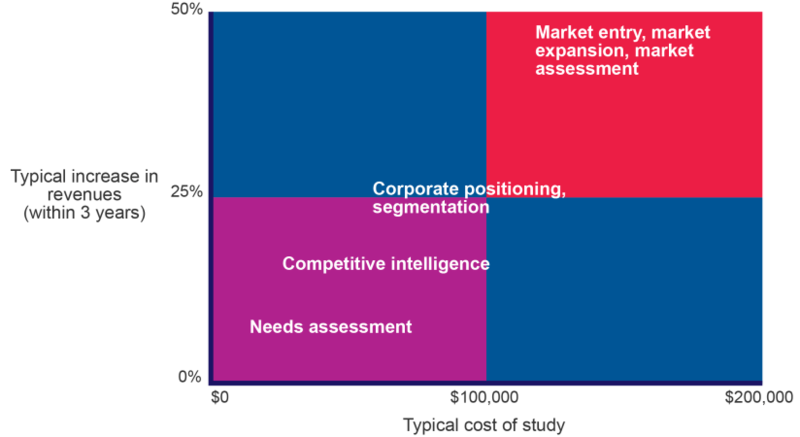 The four types of project vary greatly in terms of output, however, with corporate positioning and segmentation studies being the most complex in terms of analysis. Corporate positioning studies are designed to establish the essence of a brand, and make recommendations in terms of how to make the brand values as clear and positive as possible, and how to increase a market’s awareness of the brand. A key output of many branding studies is a competitive brand map, which uses satisfaction and perception scores provided by customers to statistically plot the relative strengths of competing companies against each other. In a brand map (see Figure 5 below), the attributes towards the center of the map are least differentiating, whilst those towards the borders are most differentiating. The same principle applies to the suppliers or brands on the map – the nearer they are to the border, the more distinct their corporate position. A supplier or brand with a truly unique positioning will be plotted near to an attribute towards the border of the map, but a distance away from competing suppliers. 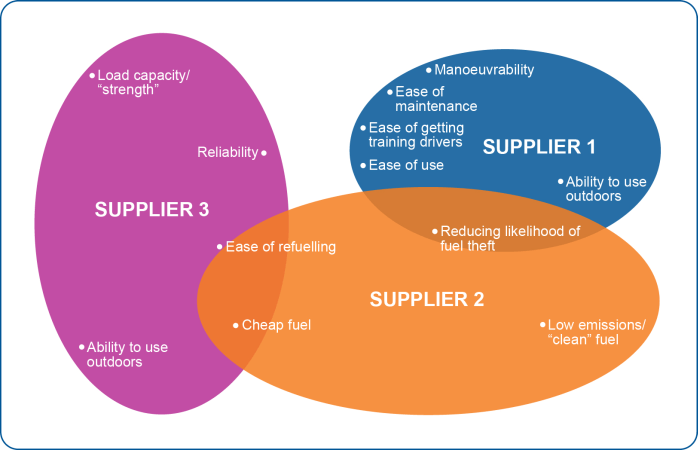 In Figure 5, it can be seen that each of the competing suppliers are perceived as being quite distinct from each other, although none has really gained ownership of a particular attribute. The forward-thinking supplier would invest in resources and marketing effort that associated it with an attribute that was distinctive, important, and in which that supplier has already demonstrated some aptitude. By communicating a clear and distinctive message and delivering against that message, the supplier can increase customer loyalty, sales revenue, prices and ultimately profitability. Segmentation, like branding, is a means of differentiating oneself from the competition, in order to increase profitability. The most effective type of segmentation – needs-based segmentation – is based upon quantitative data on the target market’s requirements. The target audience is broken down into groups of companies with similar needs. Each of these groups is then targeted (or not targeted) on the basis of these needs and the likely profitability of the segment to the supplier. Implementing the segmentation takes the form of developing and marketing different offerings for each of the chosen segments. Hence, segmentation studies have direct input into product development and marketing creative. The systematic gathering, analysis and presenting of market intelligence has taken place in Western markets for around 4 decades. Currently, however, it is in the developing markets that demand for market intelligence is increasing. Countries such as China, India, Russia, South Africa and Brazil are seeing repeated double-digit growth rates year-on-year. Most of this growth, it should be started, is driven by Western clients both inside and outside their home countries. There are few real methodological differences when it comes to obtaining market intelligence in different countries. When it comes to data collection, it is true that Asian markets, for both cultural and logistical reasons, often require more face-to-face data collection than Western markets. It is also true that market intelligence can be more difficult to obtain in developing countries. A key reason for this is that economic records tend to be less well-established. However, a market intelligence provider with well-educated employees and a multilingual capability should be capable of obtaining intelligence across different markets. Indeed, this skill is increasingly essential as the requirement for multi-country intelligence increases. This paper has summarized the main types of market intelligence, placing particular emphasis on competitor intelligence. The purpose of all of this intelligence is to increase profitability. Market entry, market expansion, market assessment and acquisition studies achieve this by advising on the correct course of action when investing in a (usually new) market presence. Needs assessment studies allow us to better meet customer requirements and therefore increase market loyalty and market share. Segmentation, branding and competitor intelligence research tend to refer to markets where there is an existing presence, and are particularly useful in helping us differentiate ourselves from the competition and capture more value. A key question, however, is what is the real ROI (return on investment) of this intelligence? How do the benefits weigh up against the costs? It is impossible to provide a definite ROI figure; however we can at the very least compare the relative ROIs of different types of project. Figure 7 below shows the typical picture in terms of outsourced market intelligence projects. Few studies cost more than $200,000, and most cost significantly less than this (assuming one study covers one market). The rewards, it can be seen, may be substantial, with market entry studies and similar projects providing huge payback in terms of revenue gains or costs saved. Unsurprisingly, less costly projects usually yield less substantial returns. The objective of this paper is to demonstrate that market intelligence can bring significant benefits to all businesses, whatever their activities or objectives. We finish by providing the reader with a brief overview and 5 key recommendations. Do the results pass the common sense test? If you have used a good supplier, they almost certainly will! Choose a provider that has been there before. Your intelligence provider should have experience of closely related industries, but also of the target countries of interest. Sensitivity to different data collection and interpretation requirements in the countries of interest to you can have a strong impact on the validity and usefulness of a project. Customer Satisfaction Surveys & Research: How to Measure CSAT Market Segmentation in B2B Markets Market Sizing: Is There A Market Size Formula?